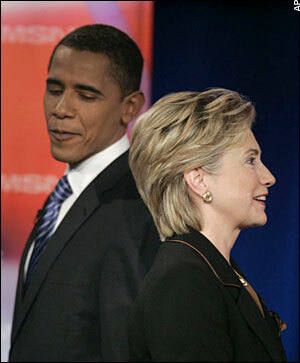 WWW.PRESIDENTS"R"US.COM / Hope Waits: Will Bill Keep Hillary & Barack Apart? Hope Waits: Will Bill Keep Hillary & Barack Apart? Clinton representatives continue negotiations with the Barack Obama transition, trying to cut a deal allowing the disinfectant of democracy to shine upon the Clinton Foundation, the Clinton Library, and Bill himself, reflecting their glory back upon America’s hoped for champion abroad, Hillary Clinton. From press accounts it seems all rather murky. The best part of the Journal story is that the Clinton negotiating team includes Doug Band, Bill Clinton’s dickish assistant. Band’s comic stylings enlivened Senator Clinton’s sinking Presidential campaign, when writing as “The Office of Former President Clinton” he unleashed a weird and meandering complaint about a Todd Purdam’s Vanity Fair story saying Bill Clinton had lost it. Part of Purdam’s offense to all things decent and Clinton was a claim that Band’s handbag magnate wife was insulted in the piece, apparently by the mention of handbags. This entry (permalink) was posted on Thursday, November 20th, 2008 at 7:00 AM by mr.president and categorized in AMERICAN HISTORY, AMERICAN PRESIDENTS, BARACK OBAMA, BILL CLINTON, FIRST LADIES, GEORGE H.W. BUSH, GEORGE W. BUSH, HILLARY CLINTON, HISTORY IN THE NEWS, PRESIDENTIAL HISTORIAN, PRESIDENTIAL HISTORY, PRESIDENTIAL LIBRARY, PRESIDENTS OF THE UNITED STATES, UNITED STATES HISTORY, US PRESIDENTS, WHITE HOUSE HISTORY.